Why we need your help | American Pride Youth Football League - Football and Cheerleading serving Dale City, Manassas, and Woodbridge. Football is the most expensive youth sport. Without your help, we would be required to charge fees that would make it virtually impossible for many children to play football. Helmets alone can cost $90. Each football player is provided with a certified helmet, shoulder pads, pants, pants pads, and jersey. We must rent the practice and game fields from Fairfax and PW park authorities. Each game has at least 3 referees that all get paid. Our players generally keep their jerseys as a memento. Given the diverse socio-economic area APYFL serves, our mission has always been to make the sport affordable for all. We charged $150 per player among the lowest fees of any of the other 23 organizations that are part of the tackle football system in which APYFL participates. We subsidize many players’ fees. These request come from parents who are struggling to make ends meet but whom still desire to provide their children with an opportunity to fully enjoy participating in these youth activities and team sports. 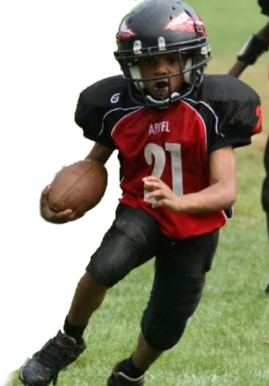 APYFL is a tax-exempt 501c3 organization serving over 500 boys and girls living in the Prince William County community by offering tackle football, flag football, and cheerleading. APYFL provides children from age 7 to 16 with a safe environment to play sports, emphasizing physical fitness, skill development, sportsmanship, discipline and fun. Participants in APYFL come from across the county, including Occoquan, Dumfries, Quantico, Woodbridge, Dale City, and Manassas. Football is considered one of the most demanding and rewarding of all youth league sports. Therefore, it requires a huge commitment to the program from both player and parent. All of APYFL's more than 100 coaches and administrators are volunteers. Further, all of our coaches are required to pass multiple levels of certification administered by USA Football, as well as be cleared through a background security check. In an effort to meet all of these demands, the APYFL Board of Directors is reaching out to you specifically as a prominent business and civic leader in the community to ask for your support of APYFL this coming year by serving as a corporate sponsor.